Running a blog as it was a business can be a consuming activity, we all know how much, mostly if you write your posts in your spare time and blogging is not your first job. So every tip that can help you to get better results, even the greatest, has to be weighted with the efforts it requires to be put into practice. I know well this, since beside being a full time SEO specialist I blog (about crime novels) late in the night, so I always ask myself whether a particular improvement to my blog or my content is worthy to be implemented or not. In this post I’ll tell you how to improve your internal linking in a very quick and effective way, choosing the right posts to link one another. All you need to do is… ask Google, in three ways. Google Webmaster Tools give us a lot of useful informations about our website. One of these is the number of links each page receives: the most, the better (unless they are spammy ones). Just looking at which of your pages receives more link juice from other sites, you can figure out which of them can redistribuite its link power to that one whose ranking you’d like to improve. The one above is a screenshot showing links to an horoscope website. The green highlighted URL has almost 350 links from 30 different domains: from the very first impression this could be an excellent page in which inserting a link towards another I have to push up in the SERPs, also because I know it has few total outbound links. Another simple way to find one of your best page to insert a link in, is using a query for your keywords limited to your website. 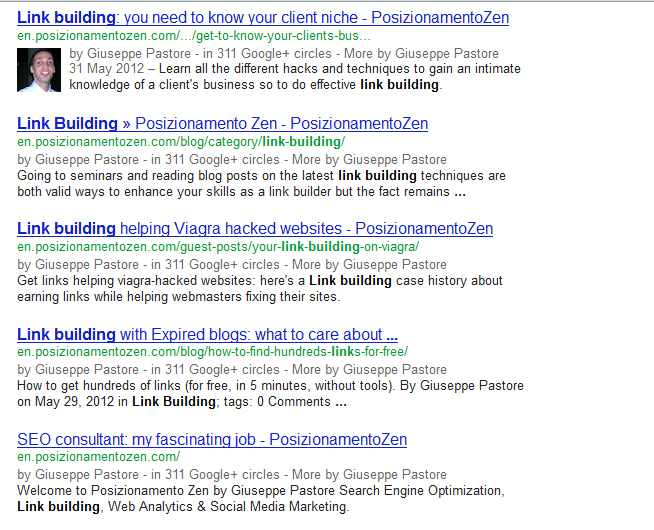 Let’s say I want to rank higher for [Link Building]; by searching [link building site:en.posizionamentozen.com] Google shows the most relevant pages for that keyphrase on my website. Adding a link from the second and the third result towards the first, chance are that this one could improve its ranking. (Little note: first post is a guest by James Agate; wrongly, Google is assigning me authorship markup even if there isn’t my rel=”author” on that page). Another underrated (and precious) information source about what Google likes of our website, is Googlebot activity. When it loves a page, the spider visits that URL very often, and the more it comes to check for changes, the more likely a link from that page could carry a significant weight. This is a tipical Googlebot visit, with the spider asking (GET) for the URL http://en.posizionamentozen.com/guest-posts/about-exact-match-domains-rankings/ and receving a 200 status code (that means the server answers: “OK, the URL you’ve requested exists and here’s the content). Looking at server logs can give you a lot of informations about how and when googlebot visits your site. But hosting providers usually don’t give you access to them, so it could be difficult for you to get suggestions directly from Googlebot. WP Bots Analytics: it’s a plugin that allows you to control search engines spiders activity with Google Analytics. This screenshot, for example, shows how Googlebot prefers visiting two particular posts more than the homepage of my italian SEO blog. Linking from these pages would really be a great idea. The tips I’ve shown you are immediate to put into practice and will give you good benefits: in this case, they really worth the time needed to better interlink your posts. Anyway, the most important takeaway for you from having read this post should be this one: no one better than Google can give you informations about your site and you should learn how to read them. Very good advice! You might want to check out Bing’s new Webmaster tools for this strategy. Their new site explorer does provide awesome link data for each page. However, it would be a little harder to compare pages side by side.